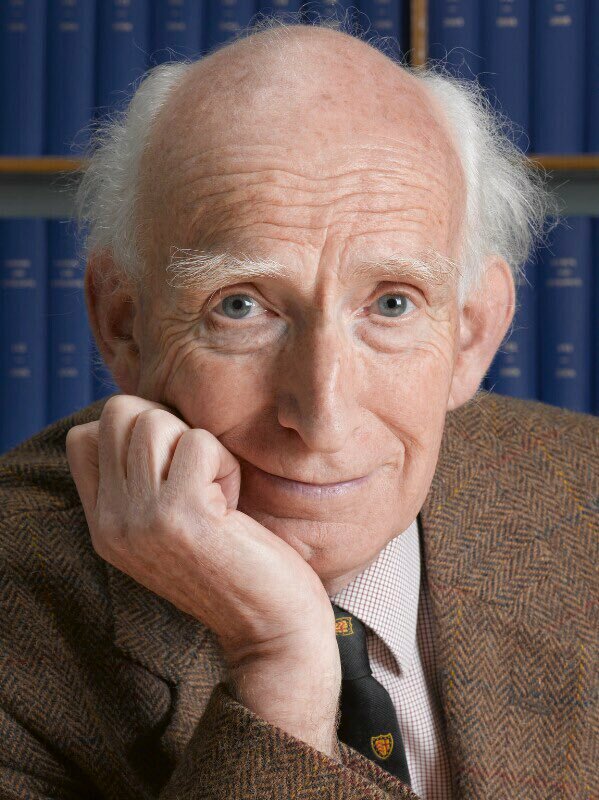 I woke this morning to the very sad news that we have lost one of our great astrophysicists, Donald Lynden-Bell (above). He had suffered a stroke before Christmas but despite the best efforts of the medical staff at Addenbrooke’s Hospital in Cambridge, he never fully recovered. He passed away peacefully, at home, yesterday at the age of 82. The Cambridge University announcement of his death can be found here. I saw Donald qjust a few months ago at the RAS Club where he seemed in good health. I was lucky enough to sit with him for dinner and he was excellent company, as he always was on such occasions. It’s very sad that he is no more. Sincere condolences to his family, friends and colleagues and especially to his wife Ruth (herself a distinguished chemist). Donald is probably best known for his theoretical work on the idea that galaxies contain massive black holes at their centre, and that such black holes are the principal source of energy in quasars. He was also a member of a group of astronomers that became known as the ‘Seven Samurai’ who postulated the existence of the Great Attractor, a concentration of matter that might explain the observed peculiar motion of the Local Group of galaxies. What was most remarkable about him, however, was the creativity he brought to a huge range of disparate topics, from data analysis to telescope design, and from thermodynamics to general relativity. Donald refused to be pigeonholed, and worked on whatever took his fancy. He brought unique imagination and insight to everything he did. I first encountered Donald Lynden-Bell when I was an undergraduate at Cambridge. He taught a first year Mathematics course for Natural Sciences students on how to solve Ordinary Differential Equations. I wouldn’t say he was the most organized lecturer I’ve ever had, but he was enormously entertaining and his remarkably loud voice meant you could never doze off! That was in 1983. I remember being terrified to see he was in the audience when I gave a talk at a conference in Cambridge as a PhD student a few years later, in 1987. He asked a question at the end that completely wrong-footed me, but I soon realised that he had a habit of doing that and it wasn’t at all malicious: he just had an unexpectedly different way of looking at things. It was quite extraordinary in that he stayed that way all through his career. It’s also remarkable how little he seemed to change in the thirty-odd years I knew him. In fact, in pictures of him taken in the 1960 he looks much the same as he did last year. I think that’s at least partly why his death was such a shock. He seemed timeless. One assumed he would live forever. At first I found Donald Lynden-Bell intellectually intimidating but it didn’t take long to find that, inside, he was actually a very amiable and kind-hearted character who was extremely generous with his time, especially with early career researchers. A couple of years ago in the occasion of his 80th birthday, a friend and former student of Donald’s, Manuela Magliocchetti, wrote an open letter to him on here. Many of his former students have posted similar messages on social media. The sense of loss is everywhere. I find then when I know someone a bit personally, no matter how much I admire them as a scientist, it’s often other things about them that I remember better than their scientific work. My most vivid memory of Donald is from a visit to India over twenty years ago. I ended up playing croquet with him on the lawn of the Director’s House at the Inter-University Centre for Astronomy and Astrophysics in Pune (where I visited last year). Donald seemed entirely unconcerned with his own progress in the game but concentrated fiercely on sending his opponents’ balls into the shrubbery whenever the rules allowed. That is, of course, a major part of the game but I didn’t expect a distinguished Cambridge Professor to take such impish delight. The game was a blast, but had to be called off in the deepening twilight, with bats circling overhead, as we could no longer see well enough to continue but I’ll remember Donald’s constant laughter. A very serious and brilliant scientist he may have been, but he also had an intensely human capacity for having a bit of fun. Rest in peace, Donald Lynden-Bell (1935-2018). This entry was posted on February 6, 2018 at 2:29 pm and is filed under The Universe and Stuff with tags Donald Lynden-Bell, Great Attractor. You can follow any responses to this entry through the RSS 2.0 feed. You can leave a response, or trackback from your own site. Always entertaining, always interested and in my experience always respectful. There are not many people that will leave a mark in science the way DLB has. A lovely report – I have so many memories of him. He seemed so well last year and talked of coming to Australia because I missed him a few years ago on his short trip through. He was a tremendous mentor and colleague in varying degrees over thirty years… I will miss him greatly. A very great shame indeed. I last saw him at a conference in Prague in 2012, where he was awarded an honorary doctorate, was guest of honor, etc. It was one of the best conferences I‘ve ever attended (I‘m sure I‘ve mentioned various aspects of it in comments here over the years) and fortunately part of this were conversations with Donald. I‘m in hospital now, which explains the dearth of comments in the last few days. I hope to return to my normal self soon. Going even more off-topic, now with Peter’s future career laid out in Maynooth, surely the Open Journal of Astrophysics will happen soon or never, right? They were very different characters and hard to compare. I always found Martin to be very quick and razor-sharp in his logic, but Donald was unique in that he just didn’t think like anyone else. The RAS meeting stood in silence for a minute today in Donald Lynden-Bell’s honour. The strongest memory I have of Donald, among a great many, is of a colloquium he gave in Nottingham to the whole Physics and Astronomy department. The subject was magnetic fields confining the jets from active galactic nuclei. He drew a parallel between some astrophysical instability and an Euler strut, in which a rigid rod deforms when subject to forces directed along its length. To illustrate this, he took a wooden pole used to pull down or push up blackboards in the lecture theatre. The pole had presumably been there since the building was constructed forty years earlier. Donald held the pole vertically, gripped the top end with both hands, and, with a twinkle in his eyes, jumped up to put all his weight on the pole. The pole deformed, and broke in half. I felt certain he knew it would break. Yes I remember that. I joked that we should send him the bill for the pole, which was used as a pointer. It was a pointer? The pole looked quite solid from where I was sitting, but that was probably some way back from the front, so my views may not be reliable. It was used as a pointer but I think it started life with some other purpose. Fine words about a wonderful human being, Peter! I should mention that academically Donald was never shy of mathematics and used those skills in diverse areas of astrophysics and GR. During the ’60s and 70’s he was, for example, renowned for his work on stellar dynamics where, notably, he introduced the concept of the “gravothermal collapse” of stellar systems to explain the fast relaxation of a stellar distribution function (aka “violent relaxation” – a term that typifies Donald’s fun approach to complex problems). Then there was the famous (and to me hard to get to grips with) fundamental work with Agris Kalnajs on spiral structure. And of course following on from his great predecessors, Bose, Einstein, Fermi and DIrac we have “Lynden-Bell statistics”. Amazing and imaginative stuff. The other,perhaps less well known but nonetheless highly interesting, work was a numerous set of papers on rotating systems in General Relativity – the Lense-Thirring Effect and all that follows from that. As you said, Peter, he would follow and contribute to whatever itook his interest, even if not “trendy”. A great scientist and at the same time a wonderful human whom I was able to appreciate as being full of empathy.